One of the great injustices of life surely is that people from poor countries need to go through ridiculous lengths to get the chance to visit rich countries. Your visa situation reminded me of this, and I remember hearing nightmarish tales of Romanians who got full college scholarships to America only to be denied an entry visa, thereby thrashing their hopes. And I remember when I exited the Shanghai embassy once, people I didn’t even know urgently asked me, “Did you get the visa?! Did you get the visa? !” Of course, the underlying reasons behind visa precautions are understandable, but it still blows. 830 RMB just to make an application??? That’s absolutely ridiculous. My girlfriend is studying as an international student in Vancouver presently, although she is a Chinese national. Also, she does not have nearly the amount of proof that your gf had stating her dislike of the idea of migrating…whether it is true or not. I’m curious as to how her visa-gaining-attempt will turn out when we try and get her a U.S. visitor’s visa for this next x-mas season to meet my family. The process for me to get the Chinese visa was drastically easier in comparison. I’ll be in Dalian meeting her family for the first time (also first time in PRC) for 2 months starting July 1. Yeah, it’s really weird how high the visa applications are. In Romania, it was $100 or so–i.e., a month’s salary for the average guy. Maybe the US Govt doesn’t want to deal with frivolous visas. If it’s too low, every retard in every poor country would be filling them out. Another thing: by keeping the cost high, the US is sort of selecting the top people (the wealthiest anyway) from various countries to visit America. (Of course, this doesn’t work for Mexico.) The system’s smart, if unfair. But hey, if life were perfect, every Chinese guy would driving a Mercedes and cavorting with Zhang Ziyi lookalikes at the Four Seasons. Also, the State Department’s budget is famously small. At the same time, don’t they have to be able to maintain US standards in all their facilities, including US-level administrative costs? And, comparatively speaking, are Chinese visas really that much cheaper? 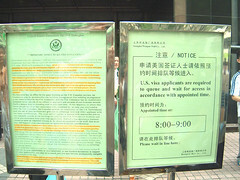 I know the last time I needed to get a re-entry visa, it set me back more than 400 yuan, just about 50 US dollars. These days getting a tourist visa to go to China has to be done either in-person or through a travel agent, and seeing as my Chinese consulate for central Florida is in Houston it ends up costing me around $100 to get a Chinese visa. The visa-issuing office in Beijing has a giant chart that shows the costs of the different visas for different nationalities. US and UK citizens seemed to pay disproportionately more the last time I looked. Hungarians get really good deals, on the other hand. I guess what I find appalling isn’t necessarily the cost of the visa, so much as its application to unsuccessful applicants. I don’t see any reason why it wouldn’t be possible to have a reduced fee for the interview more on par with the actual HR costs and then a separate fee for the visa. As is, the system seems tantamount to creating a institutional incentive for quick and indifferent interviews, and seems as brutally predatory as the English certification test racket. Anyway, I doubt Prince Roy is getting anywhere near $100 USD/hour for his time spent interviewing visa applicants. I wondered when my name was going to get dragged into this. Look, if you have a beef with US visa policy, don’t come crying to me, or take it out on one of my colleagues. Instead, write your congresspersons, and convince them to change the law. Visa policy, and all that immigration stuff falls within the purview of the legislative branch. We, as an executive branch component, merely implement the laws Congress passes, specifically the Immigration and Naturalization Act (INA). And that law is simple: we are required to presume that any applicant for a non-immigrant visa, with very few exceptions, is an intending immigrant. The burden of proof is on the applicant to show us otherwise. This includes tourists, business travelers, students/researchers, and many more. Personally, I think we get it right much more often than not. I think many of you would be shocked to discover just how many mala fide travelers attempt to obtain visas for the US at our windows. And if I do make a mistake, I’d rather err on the side of caution. But still, I maintain that we are well trained at what we do, and by far the majority of bonafide travelers do obtain visas to the US. John’s gf is a case in point. All of the considerations that go behind our decisionmaking are in the public realm, and you can read it for yourself here. Somebody also brought up the issue of cost. As far as the actual visas go, these are set by bilateral agreements between the countries involved, which you can find here. Trevelyan’s flippant remark aside, it is true that we charge approx. $100 US for the application fee, but this fee goes towards admin costs, which are quite high, given our legal guidelines, which include collecting and processing biometric info. There’s much more behind that fee than simply the visa officer’s salary. Again, based on my experience, this is definitely a plus, and has already helped us prevent many people from going to the US who harbour illicit motives. It’s money well spent and I’ve personally seen the results. What’s the percentage of Chinese who get visas to the US, and never return? Anyone have any statistics? And what are the statistics for Americans that get Chinese visas and are never seen again? Just be glad you’re not doing an immigration visa yet. I recognize you as the necessary satan. I remember surfing through a Yahoo group awhile back and there was a young lad from the States asking for advice in regards to an offer made to him in the ammount of 50,000RMB to marry someones daughter and take her to the US and then divorce her once she had obtained her green card. This kind of stuff happens. Also, take a look at the news headlines, China apparently likes to send business men, students and many others over to western countries as spies. I’m sure that once China becomes a responsible nation, others will not be so critical of granting visiting rights to her citizens. I was going to be silent, but I suppose I have the right to change my mind, and so I wish to respond to Prince Roy’s comments. I do not find Prince Roy a “Satan”, he is a “meritocrat” applying the template of merit to his job responsibilities, and I suspect he is doing a decent job of it. I think congress is wrong in having a visa requirement at all. We did not have one for the 19th century, at least for most people. It was introduced in the early 20th century, the template of merit used was promoted by labor unions to resrict the number of potential laborers (less supply, higher prices), now it is a new template, security. I think it is all bogus myself. So far I have never lost a job to a migrant Mexican or other “wetbacks”. 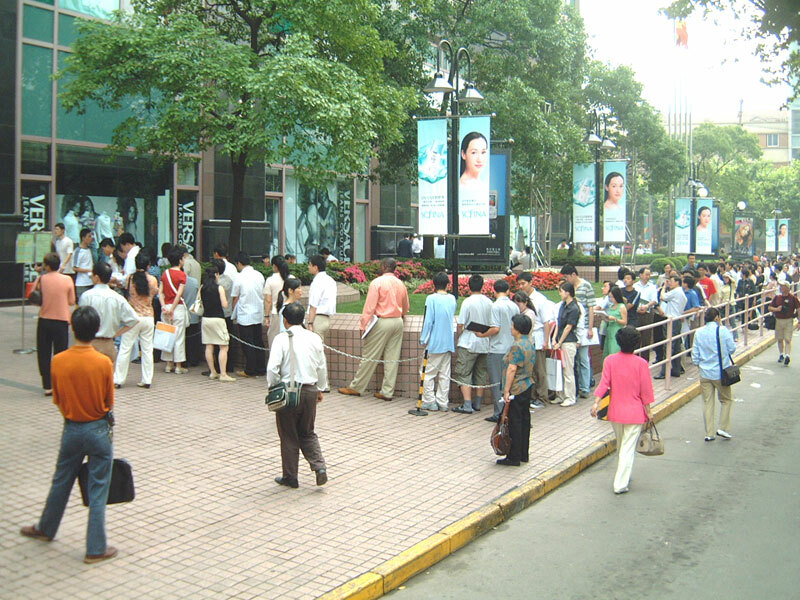 Untill the Japanese seized Shanghai, it was a free city and no passport or visa was required to enter and stay. Shanghai did not deteriate, as a matter of fact, it was vibrant and doing well. There was a lot of poverty, a lot of life, and lot of people doing things, it was probably a better city to live in than most any other comparable city in the world at that time. one of our staff was rejected during the interview as the letter of invitation he was holding from our customer was deemed to be fake. it certainly wasn’t and was in fact from a customer we used to get visas for other staff in the past. clearly there’s a level of subjectivity in these decisions. i realize the situation the state department is in, but it’s frustrating to have to jump through so many hoops to get people able to visit america for legitimate purposes. meanwhile, a blind eye is given to the millions of illegal immigrants who continue to flood into the country from mexico. I was standing in line in the China Visa office in Hong Kong when I learned a new word. On the wall was a sign explaining the reason that Americans were charged a lot more for their visa. The reason given was reciprocality. is it really so much to do with being from a “poorer country” as someone suggested? i am from the UK, somewhere that ‘enjoys a special relationship’ with the US, yet I had a very similar experience when applying for a working visa at the US embassy in Tokyo. Same crazy line up and appointment time system, same documentation file detailing life from birth up until what you had for breakfast, same security procedures, same fee sketch, and same hit or miss grilling for me and the hundreds of japanese (who also enjoy that special relationship) around me…. Well, a lot of the hassles are obviously due to heightened securities post-9/11. A lot of terrorists hold Western passports so the extra security is understandable. Thanks for sharing the experience with us! I found yr blog when i was looking for the reason of people with china passport not getting US visa approved. I’m having a msian passport myself, but a friend of mine is holding a china passport with australian PR. She got invited for a machine learning conference in the states, and we suspected it’s because it has to do with security issues which is very sensitive to the states, her applications is still ‘under process’ after a few months! Why do Americans always expect to be treated better than the shytty way they treat others? Hell, the US banned Chinese immigration for over 60 years up until WWII with their Chinese Exclusion Act. So, quit whining because you have to queue for a Chinese visa now. Boo-fvcking-hoo-ha. I met a wonderful woman on line i went to changsha china 2 times now i have no more money and we are inlove.I regret not being a little rich,iam 62 and this is probabley my last chance at love.The chinese in changsha are wonderful people especially the children and part of my heart is in that city with my Hexiaomei.the woman who i love dearley.does anyone have a good heart?